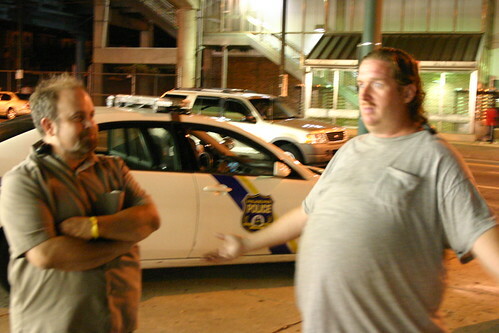 Phil Pappas, left, and Mike Mawson, of West Frankford Town Watch, outside the Thriftway at Frankford Avenue and Pratt Street around 2 a.m. Sat. July 10. NEast Philly demonstrates again what a real hyper local news outfit should be about as it rides along with the the West Frankford Town Watch. Friend of Frankford Chris Wink was out with Phil Pappas and Mike Mawson as they patrolled the surrounds of Frankford on July 10th. The profile shows their dedication while noting how other neighborhood town watches have their memberships eb and flow over the years. Great work guys.